I'm going to do a quasi-Genealogy Do-Over. Since June 2014, I've been working one family at a time in my genealogy management program. I created a new database, adding only myself and my father. I then added his parents and siblings and have been working hard to pull together all of my scanned images, online tree (Ancestry.com, FamilySearch, MyHeritage) discoveries and paper files in one place. Regarding backing up, I use Dropbox for everything, and have activated this cloud storage service with the program on both my laptop and my desktop computer. I particularly like that all files are fully accessible from any computer. If I travel without my computers, I can login to my account on any other computer to access my files. Dropbox files are not compressed, as in a backup service, and therefore do not need to be "restored." Updating my laptop with my desktop data is as easy as turning on the laptop with internet access and stepping away for a bit so Dropbox can automatically sync a copy of my desktop computer files to my laptop's hard drive. I am following the Genealogy Do-Over Golden Rules. The OFFICIAL Genealogy Do-Over - Week 1: 2-8 January 2015 | GeneaBloggers Topics: 1) Setting Previous Research Aside, 2) Preparing to Research, and 3) Establishing Base Practices and Guidelines. Rather than set aside all previous research, I'm working through my first two generations, where I've known the individuals per my quasi-Genealogy Do-Over comment above. I've installed Folder Marker (the software to color code computer folders) http://foldermarker.com/index.php and cleaned up my maiden name folder. This is phenominal, since everything used to be thrown into that folder. Each sub-folder bears the name of the couple through which I descend. A wife's maiden name is indicated. There are no birth or death dates listed because for many earlier generations, that information has to be construed from multiple, sometimes conflicting sources. Any documentation relating to a woman's childhood prior to the marriage would be in the appropriate surname (maiden) name folder elsewhere on my hard drive, where she, is for instance, listed as a child in her parents' household on a census record. The folders are colored RED if I haven't finished working on what I've collected digitally. Once each item within a folder is attached to the appropriate ancestor, the folder to changed to GREEN. Any future scans of photos and documents will be added one at a time when attaching to the appropriate ancestor in my genealogy software program, so my folder will continue to be worthy of the GREEN status. author's direct line couples indicated. Each SPOUSE has her own folder including photos taken during the marriage, the marriage certificate, death certificate and such. As I complete work in each folder, the folder color is changed to GREEN. 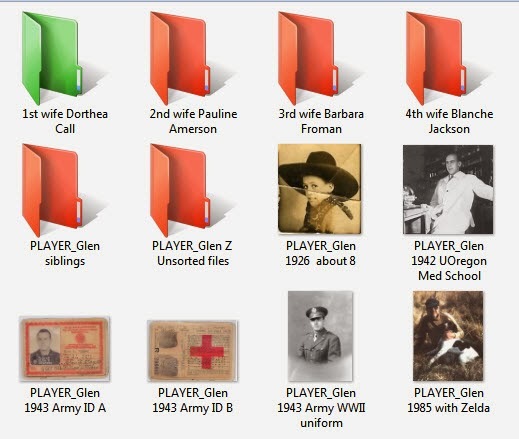 SIBLINGS have their own folders as a sub-folder of the PLAYER_Glen Siblings folder. 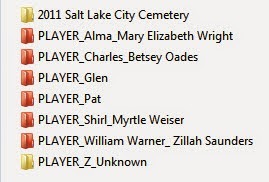 PLAYER_Glen Z Unsorted Files (in the image above) is where I place all the scanned images I collect, but have not yet renamed and attached to Glen Player. You can probably construe my naming system here. I really like the color change based on that information being incorporated into your database. Thanks for a reminder and works for folders. In the drafting/engineer world, red means changes to be made, green means changes done, blue means notes attached and each change is the date it was marked. Works great for Genealogy and FGS sheets used for markups. This was my job in retail business and works with genealogy also. Every little tip and idea helps. I'm trying to go very slowly here in re-organizing files and folders since it's my big bugaboo! Merci! Yes, Celia, the concept of going slowly to reorganize files and folders has been a breakthrough for me these past six months. Let me know how it goes for you. I will share my folder marking system with a post on my blog. 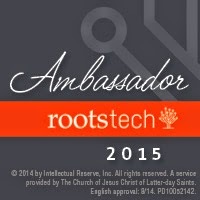 I will post a link in the community and on the Facebook group for the genealogy do-over. I will also describe how I am trying to link both digital and paper files together so that I can find what I want in either system quickly and easily. I may eventually discard some of the paper copies that I printed but the original certificate and other documents that I have scanned will remain on file. I also plan to do a short recording about Custodian 4 as anyone needing to organize and index their sources may want to take a look at this program. Dear Hillary, I look forward to hearing about your folder marking system. In the first several days I changed from "collateral" to "siblings" quite simply because I thought it easier for my descendants to relate to my folder system better. I have made a decision to get rid of all paper files EXCEPT original, one of a kind documents. Hillary, I too look forward to hearing more about your folder system. I have a pretty good system that works 'fairly' well, but there is always room for improvement. Pat, Thank you for the tip about the color coded folders. I love the idea. Yay for color-coding. This is great, Myrt - thank you for the visual! :) - Cate. I'd never heard of Folder Marker before. Thanks for sharing this Pat!